1949 Taps For The Grand Army - Artmaster Plate Block. Scott # 796. Flap bleed. Scott # C24. Flap bleed. 1st day of sale at Philatelic Agency. Scott # 902. Extreme Flap Bleed. Scott # 902. Goldman R/S to back. 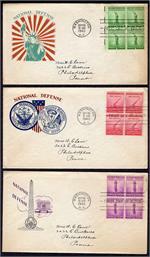 1940 1c Statue of Liberty - Linprint. Scott # 900. Light flap bleed. Scott # 898. Light glue stain to back. 1940 Coronado Explores Southwest 400th - Cachet Craft. Scott # 898. Extreme flap bleed. Scott 898. Extreme flap bleed. Scott #'s 899-901. Flap bleed. Scott # 889. EXTREME flap bleed. Scott #'s 864-868. Extreme flap bleed. Scott # 888. Flap bleed. Corner creases. Scott # 884. Flap bleed. Scott # 862. Creases. Flap bleed. Scott # 871. Flap bleed. Scott # 880. Flap bleed.